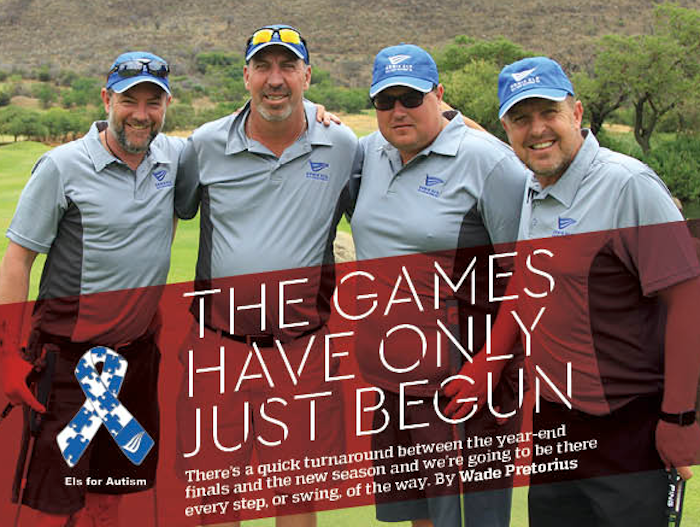 There’s a quick turnaround between the year-end finals and the new season, and we’re going to be there every step, or swing, of the way, writes WADE PRETORIUS in Compleat Golfer. A year-long journey to the Lost City for the 2018 Els for Austism final ended with a thrilling win for Marius de Bruyn and Gerrit Kuhn. The pair led the field by two after the 1st hole, but the leaderboard had a different look with just nine holes to play. The friends, who topped the field at the Stellenbosch event to advance to the final, found themselves a point behind as the contest turned into a matchplay battle. But it was De Bruyn and Kuhn who emerged triumphant after superb golf around one of the country’s most unforgiving tracks. After two fun-filled, competitive days the victors were swiftly moved on to accept their grand prize: a place at the Nedbank Golf Challenge Pro-Am, arguably one of local golf’s hottest tickets. A quick look at De Bruyn’s social media profile shows him standing with four-time Major champion Rory McIlroy. The Stellenbosch pair were partnered with Sweden’s Alexander Bjork for the day and thoroughly enjoyed a front-row seat to how the Volvo China Open champion goes about preparing for one of the biggest weeks on the European Tour calendar. ‘We loved getting so close to these players. They are just so good and make the game look easy,’ adds De Bruyn, who could not stop praising the organisers for putting on such an excellent event. And much like the biggest golf tours have ‘wraparound’ seasons, the new Els for Autism series doesn’t wait until January to start a new chapter. No, the 2019 series kicks off in December when San Lameer Country Club again plays host to a full field. Nico van Rensburg, the man behind the charity drive, promises a bigger and better year ahead. Compleat Golfer will be along for the ride once more as proud media partner of the series. This year, we are going to ask readers to join us at the golf days and help give an even bigger push to the cause. Stay glued to our competition page and social media channels as we add to the excitement of what promises to be another thrilling race to the final. – This article first appeared in the December issue of Compleat Golfer, now on sale!